Empire Style American Sideboard — Bernacki & Associates, Inc. Though structurally sound, the sideboard arrived with its surface marred by abrasions, its edges worn, and its veneer chipped and splitting. Drawers were out of alignment and cracked from expansion and pilaster doors were loose at the hinges. Carved moldings connected to the frame wobbled with movement. 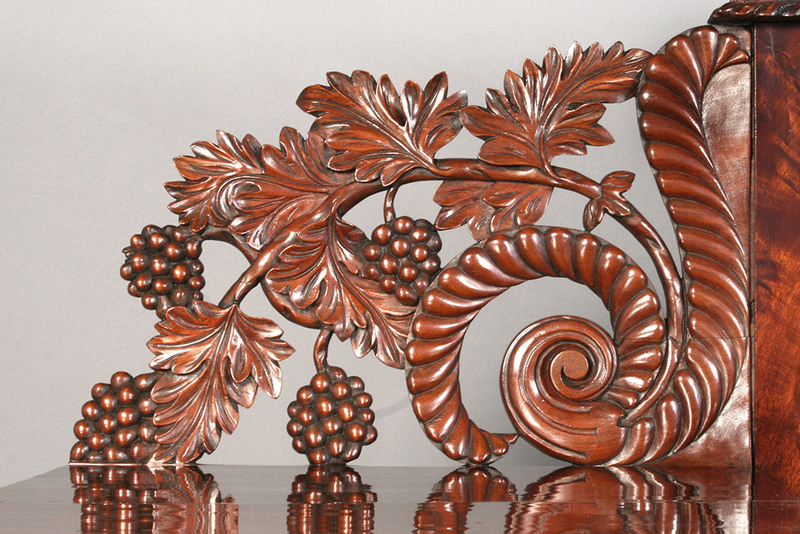 Both original and non-original finish had accumulated atop the decorative carved grape leaf motif, causing its once-majestic mahogany surface and grain to become clouded in discoloration. Bernacki & Associates began structural conservation by dissembling casing and elements. Loose veneer was consolidated throughout the entire piece and missing portions in-filled with wood species matching the original design. Carved molding was stabilized and a section of decorative trim replaced. Drawers - repaired of splits - were equally aligned and door hinges secured. Finally, the finish was conserved. Surface imperfections were retouched for a smooth exterior. Expert cleaning revealed the full, rich color of the original piece, improved upon by shellac polish. After an application of wax and thorough hand buffing, the surface gleamed with even luster, providing a perfect “finishing” touch to this exquisite piece of furniture.